Clarence Seedorf went abroad on an early age. At his 27th, he has won with AC Milan his third Champions League for three different clubs. (Ajax, Real Madrid and Milan). Seedorf extended several times his contract. In 2007 his successful stay at the Italian giants was confirmed with a contract until 2011. Being the captain of the Rossoneri in the 2010-11 season, he was offered a year extension on his contract at the end of the season. 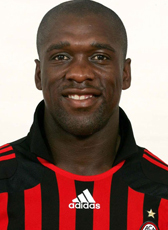 He agreed the deal and the 2011-12 season was Seedorf his 10th season for the Milan club. Seedorf played for Milan more than 300 matches. At the end of the season he announced a move to the country of his wife, Brazil. He joined Botafogo on a 2-year contract until 2014. In January he made a surprising move back to Italy. Seedorf retired as professional football player at the age of 37 years and became the head coach of AC Milan.